Are you ready for the Super Bowl? Super Bowl 50 takes place Sunday between the Denver Broncos and Carolina Panthers, and the annual championship football game will find many people celebrating at home. You’ve likely thought of everything. Perhaps your big-screen TV will be ready-to-go, your favorite pizza place will be on speed dial, and your shopping list is complete with ingredients for some famous massive nachos. But it turns out that those of you celebrating in Carolina and Denver may not have thought of everything. In a new study published in the American Journal of Health Economics, Tulane University researchers found that cities with a team in the Super Bowl have a rise in flu-related deaths. According to the Centers for Disease Control and Prevention, the flu, also known as the influenza virus, affects five to 20% of the U.S. population every year. As a result, there can be an average of 3,000 to 49,000 flu-related deaths per flu season. Flu season is typically between October and May. This year the flu season is likely to be a mild one, but many deaths are still expected to occur. How did the researchers come to this conclusion? For the study, the researchers examined statistics from 1974 to 2009. They found that having your home team in the Super Bowl led to an 18% increase in flu-related deaths in adults aged 65 and older. Why does the number of flu-related deaths spike in cities with teams in the Super Bowl? It’s because the big game occurs during flu season, and many people are in close contact with each other while watching it. The flu is highly contagious, and it spreads from coughing and sneezing. 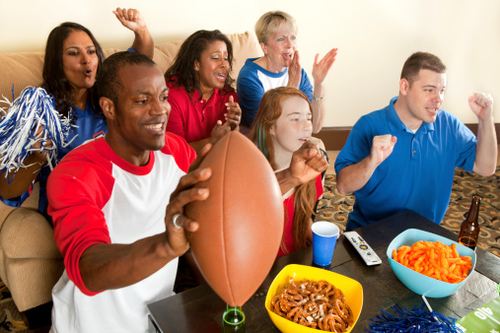 While celebrating the Super Bowl you may be at risk from contracting the flu from handling the TV remote, doorknob, telephone, or even the food at the party. The researchers did not, however, find an increase in flu-related deaths in cities that host the Super Bowl. This is likely because the game is held in cities with warmer climates that reduce the chance of transmission. This year the Super Bowl is being held in Santa Clara, California. Many people race to get their flu shot for protection. However, the CDC considers the flu vaccine about 18% effective against the flu. Luckily, there are many other ways to protect against the flu. It is a good idea to build your immune system with plenty of nutrients, including vitamins A, C, and E, zinc, iron, selenium, and B vitamins like B12, B6, and folic acid. Other good supplements that can help prevent the flu include a high-potency probiotic, vitamin D3, and ginger. Super Bowl parties also typically contain lots of junk food. Instead, it may be a good idea to prepare healthy snacks like nuts and seeds, guacamole dip, veggies, fruits, and organic, grass-fed, free-range chicken wings. It is also helpful to avoid processed sugar leading up to the big game. Stoecker, C., et al., “Success Is Something to Sneeze At: Influenza Mortality in Cities that Participate in the Super Bowl,” Tulane Economics Working Paper Series, 2015, Tulane University. “Seasonal Influenza Q&A,” Centers for Disease Control and Prevention web site, last updated September 18, 2015; http://www.cdc.gov/flu/about/qa/disease.htm, last accessed February 2, 2015.